When Michael Lewis authored the book Moneyball back in 2003, I don’t think anyone could have predicted the sweeping impact it would have in boardrooms and offices across the nation. 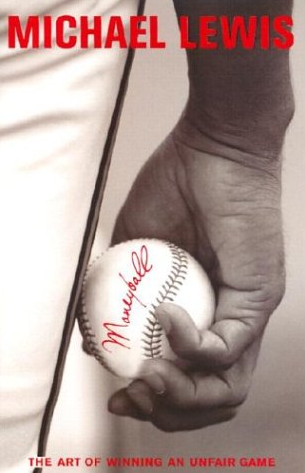 By illustrating how organizations can use big data and analytics to identify market opportunities, Moneyball made accessible a previously arcane science and ushered in a new era of data-driven decision making. But while the rest of corporate America dove headfirst into big data nearly a decade ago, only recently has it caught on in the government affairs space. Now, lobbyists up and down K Street are looking to new data and analytics tools to help them uncover hidden relationships between lawmakers, hoping to break through the partisan gridlock of Capitol Hill. While a small number of adopters are finding success in the world of data-driven advocacy, most offices struggle with how to best use these new tools. If you’re playing around with the data, it’s unlikely you’ll ever uncover any useful insights. Successful use of data and analytics hinges on two things — being decision-oriented and hypothesis-driven. Decision-oriented: Everything we do with data is focused on helping us more confidently make a decision. Hypothesis-driven: Done correctly, we’re using data and analytics to pressure-test our assumptions. Even better, we use analytics to remove assumptions from our strategies. Our research team identified a firm taking the right approach to data and analytics — Holland and Knight (H&K), working on behalf of one of their corporate clients. For privacy reasons, we’ll call this client Archimedes Industries. The firm was working with Archimedes to secure support for a specific piece of legislation. And as any Washington hand knows, that means identifying, recruiting and developing congressional champions — lawmakers who will strongly support the effort. The conventional approach, laid out below, is to pull the team together in the conference room and start throwing out names of legislators you think have potential. It’s a solid start that will get you pretty far, but it leaves you open to blind spots and intellectual bias. Often times, instead of offering up names of lawmakers with real potential, you offer up the names of lawmakers you know. Those are two very different things. In the end, legislators with real potential will be overlooked, left off the list. H&K solved this problem by taking a different approach to identifying potential champions. In the graphic below, we’ve laid out their process on the left side. It started in the conventional manner, with the H&K team brainstorming potential champions. But then it broke from convention. H&K took that initial list and used data from Quorum to pressure-test their hypothesis. Quorum, like FiscalNote, GovPredict and Unfold, is an analytics tool that tracks the activity and movements of Congress. One of the key features these tools have is the ability to “rank” lawmakers across different criteria and assign them ratings; similar to how you might rate players on a fantasy sports team. 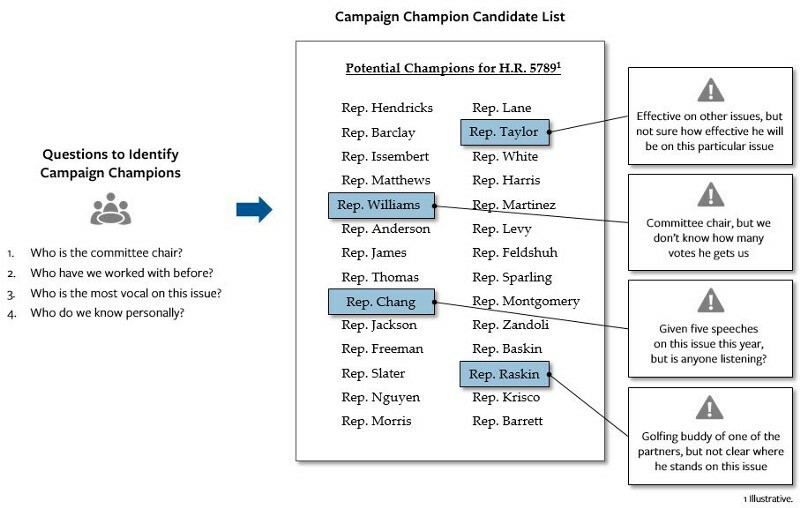 The highest-potential champions for this legislative effort were those in the middle of the Venn diagram (on the right) — they were active, influential and effective. There were no “show ponies” in this group — these lawmakers could get things done. Based on this analysis, the H&K team could reassess their list of names. Some members who seemed like strong candidates at first didn’t necessarily make the final cut. Others who weren’t identified in the initial session, but scored well, might have been added to the list. And they used the scores to prioritize the list of legislators to go after. Now, I don’t want you to think they turned everything over to a computer. They didn’t. What they did was to use a strong, data-driven process to test their hypotheses and get to a decision. And there was one last step, laid out below. You can see how this works. This is where your years of experience and professional judgment come into play. As we all know, legislators are complicated people — and scores alone do not an ideal candidate make. The H&K team fine-tuned their champion list before sharing it with their client. There’s a lot to like about what happened here. The team combined analytics and experience to ensure their resource allocation was appropriate. They used good processes to remove the “gut feeling” and the assumptions from their strategy. They could confidently present the list to their client knowing that the data backed them up; that this was the right move. And they could get to this point far more quickly than they could have without analytics. That’s the power here — with a solid process and good analytics, they were able to play at the top of their game consistently and deliver greater value for their client. But you only get to this point if you’re using data and analytics correctly — and that means being decision-oriented and hypothesis-driven.